Local tattoo artist Corey Thompson's no stranger to giving. For the past several Christmases, he's participated in toys for tats-style benefits at other shops he's worked at before opening Wayward Tattoo Studio. These events are simple but profound: Bring in a toy to donate that'll brighten a child's holiday, and in turn, get a tattoo from a local artist, thereby encouraging folks looking not to show off their new reindeer antler hat or their rad, ugly sweater at this year's office party to ring in the holiday spirit by sporting some slick new ink while doing good in the process. 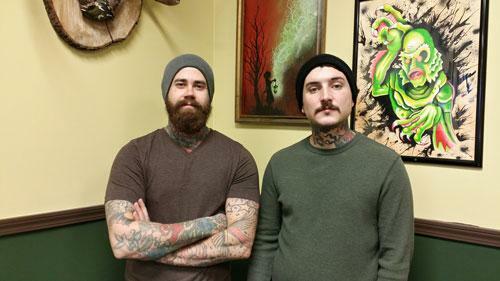 So it made sense that when he – along with local tattoo artist Johnny Matters – opened their own studio together last year, that they'd keep up the tradition. "It was important to us to continue this benefit because it's a way we can show our appreciation for Erie," Corey explains. "We are blessed with great clientele and careers based off of what this town has given us. It's one way we can give back." Corey, Johnny, and the three other artists tattooing out of Wayward Tattoo will team up with some special guests from Karma Tattoo to benefit The Arc of Erie, a local nonprofit advocacy agency started sixty-two years ago that provides support for individuals with intellectual and/or development disabilities and their families. "Johnny and I decided to team up with Karma out of respect for what Josh [Makowski, who owns and operates Karma, and with whom Corey and Johnny cut their teeth] has given us, to work with our friends, and to help get more people tattooed!" Corey says. For Wayward artist "Eerie" Eric Fargiogio, participating in events like this carries an extra special meaning. "I have a soft spot for kids with special needs," he says. "I had some of my coolest Christmases in Erie's own Shriners Hospital." Fargiogio, who won both Erie Reader's 2014 Best Of Erie Best Tattoo Artist and Best Illustrator awards, was diagnosed with juvenile rheumatoid arthritis just a year-and-a-half into his life. He says he fondly recalls all of the cool toys he got from kind-hearted people those holidays he spent in a hospital and still thinks about an Evel Knieval action figure he was given through charity. "We hope the Erie community will see and appreciate the support from The Arc and our friends at Wayward," says Arc board member Joanie Froehlich, whose five-year-old daughter Bella has Down syndrome. "When our family needed helped, we turned to The Arc. I saw firsthand what their mission was and I have been with them ever since." So forget the Christmas sweater or light-bulb adorned hat; instead, Erie residents again have the chance to show off some fresh art at the holiday parties this year by brightening a child's Christmas. Partaking in this process is simple: Bring an unwrapped toy valued at least at $20 to Wayward. The toys will be distributed to children participating in the "Include Me From The Start" program within the Erie School District, as well as children who receive services through Erie Homes for Children and Adults, The Barber National Institute, Lake Erie Area Down Syndrome Society, and The Arc of Erie County, according to Joanie. Tattoo options will come from predetermined flash pieces the artists have contributed, from which there'll be plenty to choose. From holiday-inspired art to Corey's personal favorite (a mini-portrait of Bubbles from Trailer Park Boys), there's guaranteed to be something for damn-near everyone (read: remember that this event is aimed at helping children have a merrier Christmas, not at getting you that tailored sleeve you've always wanted, so be polite and don't make special requests). Keep in mind, too, that all of the artists are donating their time, supplies, and energy, so this tattooed editor strongly encourages you to tip your artist. Also remember that it's limited to one tattoo per person so that everyone can get some art, it's not limited, however, to just one toy, which means you're welcomed to bring as many gifts to donate as you'd like. "Seven hours is a long day for a tattoo artist – our day will be longer, I'm sure," Corey says. "Tattooing all day can take it out of you – your back hurts, your hands hurt, but after a while, you forget about all that and just become a tattoo artist. You lose focus on anything but what your hands are doing. When I see that long line in the morning, walking up to the shop, it's like the ride to the top of the coaster – you don't really know how the ride's gonna go, but you're excited to fall."